Four Seasons Cottage Self-cateringA lovely Lakeland stone built courtyard cottage that has been renovated to a high standard. Four Seasons welcomes you into a lounge, kitchen diner with solid oak furnishings. Kick off your boots and relax into this well located property just out of the centre of Ambleside. A level 2 minute walk will take you to the shops, garden centre, pubs and restaurants, while 10 minutes away is Waterhead from here you can take a boat ride across Lake Windermere. Accommodation: Entrance hall, with hanging space for waterproofs and muddy boots. Sitting/dining room (40" TV, TalkTalk YouView essential TV package with 7 day catch up and on demand TV, Blu-Ray player with a selection of family friendly DVD's and Blu-Ray discs, Wi-Fi, DAB Radio and CD player, electric fire) leads in to a fitted kitchen with induction hob and electric oven, dishwasher, microwave, fridge and store room. Upstairs are two modern decorated bedrooms - one double and one single with solid oak bedroom furniture providing ample cupboard and wardrobe space. The newly fitted Bathroom has bath with mains pressure shower over, basin and wc. Airing space is available for wet clothes. Furnishings throughout are comfortable with a leather suite, oak pieces and oak effect flooring downstairs, fully carpeted stairs and bedrooms. The cottage is double glazed and has gas central heating making it cosy throughout the year. Outside: There is private parking for one car in the courtyard and a small seating area with wooden bench ideal to catch the afternoon sun. Shops and restaurants in Ambleside are just a few minutes level walk. 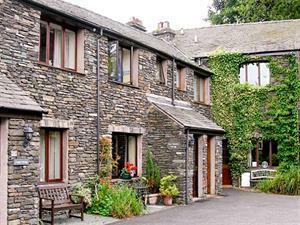 Ambleside bus station and laundrette are nearby, with a public phone 200 yards away. Four Seasons makes an ideal holiday cottage any time of the year. Note: cot can only be located in the single room due to space. A lovely Lakeland stone built courtyard cottage, recently renovated to a high standard. Kick off your boots and relax into this well located property just out of the centre of Ambleside ideally placed for a holiday in any season. Alarm clock, no room for a cot. Children welcome from any age. Four Seasons Cottage offers weekly bookings starting on Saturday.